This is an easy and healthy meal suitable for entertaining. For a weeknight meal, and to lower the calorie count, you can omit the potatoes. However, they make a stand-out dish and take this meal to the next level. Great for serving to guests or a nice Friday or Saturday night dinner at home. This is a regular meal in my house year round (although it’s especially great in summer when you don’t want to heat up the house with a lot of cooking). These are really quick and easy and the combination of flavors is amazing. Delicious and easy shrimp tacos. Toss vegetables with aioli, cilantro and lime juice and set aside. Toss the shrimp with the seasonings and sauté in canola oil until cooked through. Chop up the shrimp or leave it whole. Heat tortillas** on a cast iron gill pan until they are warmed and have grill marks. 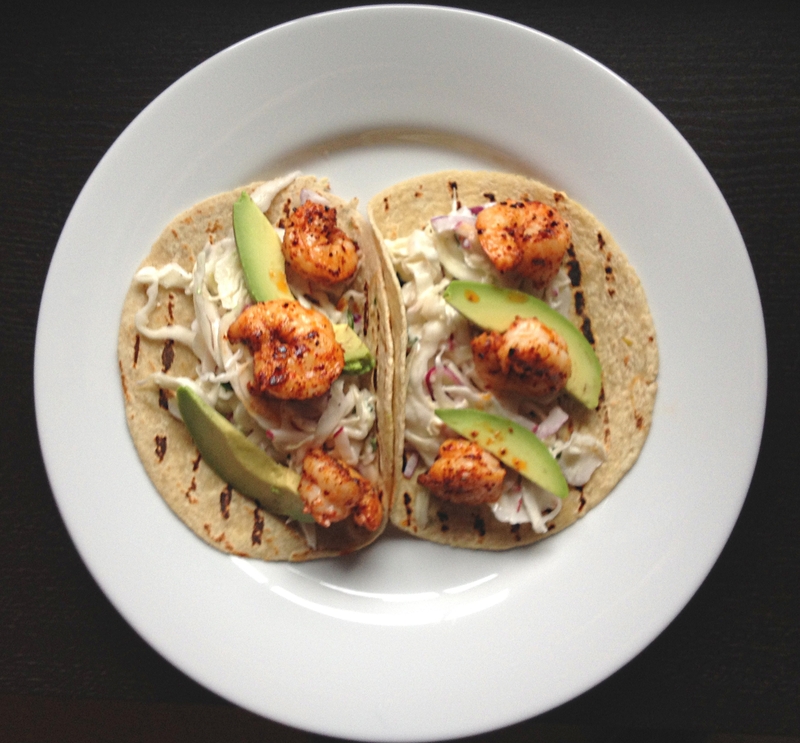 Serve the shrimp and slaw on corn tortillas** topped with avocado slices. *I love Wildwood Zesty Garlic Aioli. It's an eggless/vegan mayo that has a great garlic flavor. You could probably substitute regular mayo and add some minced or pressed garlic. However, I really recommend the Wildwood product, because the flavor and texture are amazing. It's also great for picnic salads and sandwiches because it's eggless and you don't have to worry about food poisoning. I also use it on BLTs. **One other product plug - I get the most amazing corn tortillas at Whole Foods. The brand is Mi Abuelita Bonita. They make amazing green chile tortillas. They are corn tortillas, but they have a texture that is closer to a flour tortilla. The only place I have ever seen them is Whole Foods. Light fish, summer herbs and vegetables, and what I consider a "cheaters" risotto because you don't have to stand over the stove stirring it. Perfect for summer produce and temperatures. A salad with stone fruit(s) and basil with a light vinaigrette is a great seasonal compliment. Divide corn kernels in half and place one half in blender or food processor with a little water to make a creamy corn mixture; reserve remaining corn kernels. Heat butter and olive oil over medium heat; add onion and garlic and sautee for 2-3 minutes or until onions are translucent. Add white wine, salt and pepper and cook for 2-3 more minutes. Add pureed corn and 2 1/2 cups of broth; cover pan, and put in preheated oven for 15 minutes. After 15 minutes have passed, check pan and stir in remaining corn. If most of the broth has been absorbed, add more. Cover, and return to oven for 15 more minutes. Remove pan from oven, stir to remove rice from the bottom and sides of pan and add half of the basil, scallions, and parsley. Add tomatos, re-cover and set aside. In a small bowl, mix together panko, remaining half of herbs and aioli. 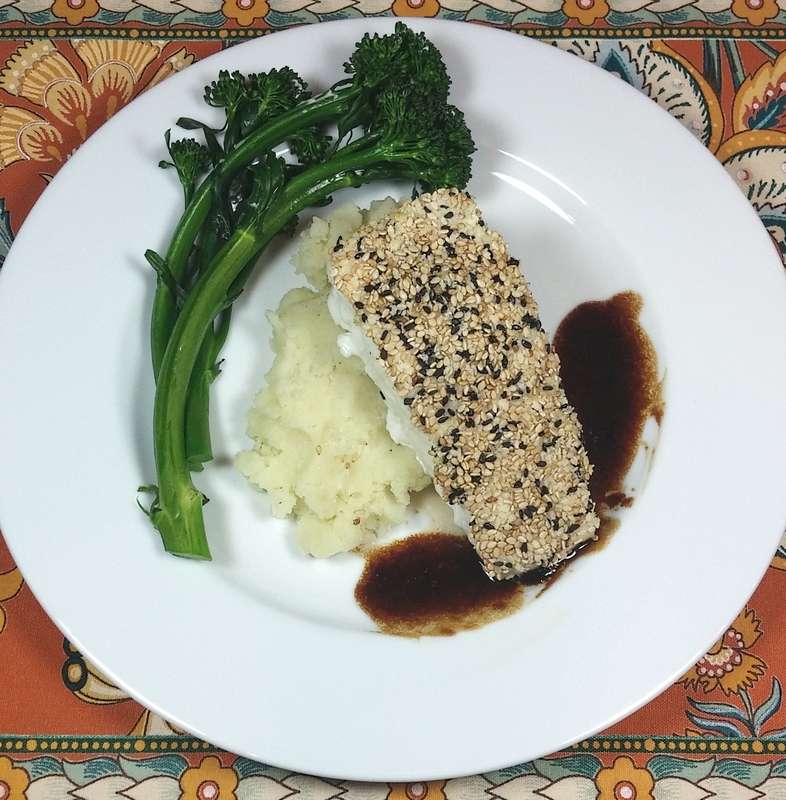 Place halibut filets on a parchment-lined baking sheet and top with breadcrumb mixture. Bake for 10-12 minutes until halibut is opaque and firm to the touch. 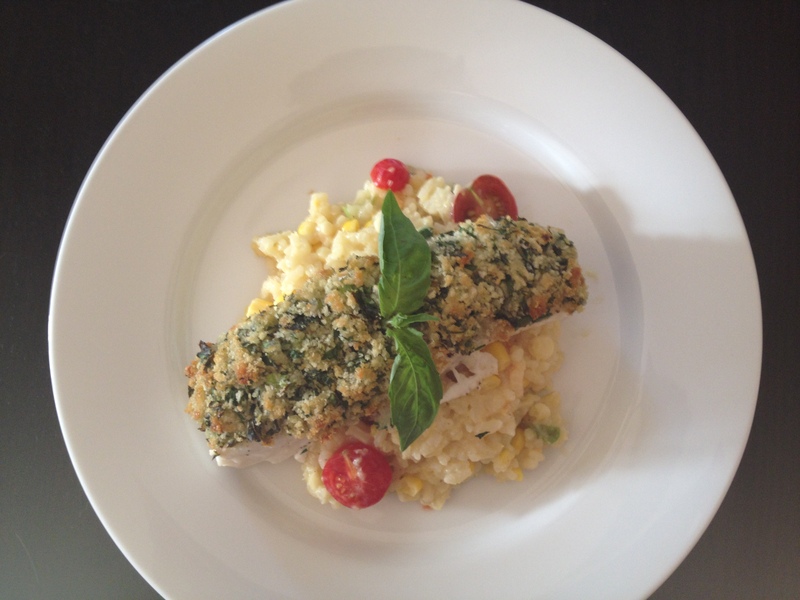 Serve halibut on risotto garnished with basil.